In the wake of the horrendous tornadoes that delivered massive destruction to the state in April, University of Alabama engineers have analyzed building structures and design codes to recommend an approach to safer and stronger buildings going forward. A research team, consisting of academic researchers from multiple universities and professional engineers, received a National Science Foundation RAPID Response Grant for Exploratory Research to investigate and gather data about the damage to, and performance of, wood-frame structures in the affected areas due to strong winds. A University of Alabama release reports that the team primarily looked at residential and multi-family apartments, but it also reviewed some steel and masonry buildings. The research team inspected the 5.9-mile affected tornado path in Tuscaloosa on 2-5 May to analyze wood-frame structures that were damaged by wind and windblown debris. Following clearance from FEMA’s Engineering Division, the team inspected more than 150 structures in extensive detail. Collecting more than 3,000 photos of single family homes (one- and two-story) and apartment complexes, the team determined the EF-Scale rating in relation to damage for each structure in order to develop a swath, or contour, map showing the localized intensity of the tornado. Light-frame wood buildings do not, and will not, have the ability to resist EF4 or EF5 tornadoes. The level of damage to light-frame buildings at lower wind speeds is not acceptable and can be reduced through new engineering design and construction practices. A systematic study needs to be conducted that focuses on the optimal threshold tornado wind speed for which engineers should be designing, likely an effort to provide a uniform-risk design. Virtually all buildings in the path of a strong tornado, even along the outer edges where wind speeds are lower, are irreparable based on current design and construction practices. This provides incentive and an opportunity for tornado-resistant design and construction practices which currently do not exist. Vertical load paths were not adequate, regardless of the age of the residential structure. Load paths appeared to be better provided on multi-family buildings. 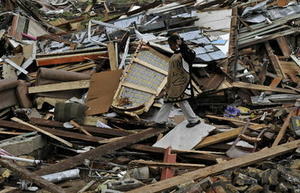 The current understanding of tornado loading on structures is not comprehensive or even comparable to that for strong straight line winds because of the high level of turbulence and debris in tornadoes, and the vertical uplift forces in a vortex can be as much as 3.2 times larger than straight wind counterparts. Acceptable and implementable approaches in design and construction are needed to realize damage reduction. Design and retrofit measures should be developed to reduce structural and component damage up to the threshold wind speed. Implementing hurricane region construction practices and products in tornado-prone regions is an excellent starting point, but this may not necessarily be an end solution. Interior closets and bathrooms provide shelter at lower wind speeds on the edges of the tornado, but they were no guarantee of survival. The concept of a “safe spot” should still be taught, but a safe spot is not a substitute for a safe room or tornado shelter. For wind speeds exceeding the threshold, the alternatives of a shelter or safe room can provide life safety to building occupants. The release notes that the research team received the grant because of the University of Alabama’s location to the proximity of the affected areas. The National Science Foundation recognized the urgency with the grant request because this type of data is perishable in that once debris removal begins there is no way to analyze the performance of the wood structures. The grant is being provided to The University of Florida to work in close collaboration with UA and other researchers.